One of the central facets of my novel, SHADOWBOX, is the river goddess known as the Lady, first introduced in THE LAST RHINEMAIDEN. As a core concept, this river goddess interacts with the main character in subtle ways, and thus the rivers of Paris and London take their place within the novel. In fact, both the Thames and the Seine – with the Rhine completing the picture – shaped the underlying concept behind both novels. But first: mythology aside, how important are the Seine and the Thames in the landscape? What are their similarities, and their differences, at the point where the river intersects with the city? The major river in each city is fed from a large catchment area. There are tributaries within the city walls of both Paris and London, some of these minor rivers and streams channeled into the underground drainage systems even as far back as 1832. Paris lies on the Seine far inland. Although still navigable, the river is narrow enough to place a gate across the water to allow Customs and Excise duty to be extracted from the river-borne trade. Henry IV fortified the Ile de la Cité in 1514, creating a citadel within the outer boundaries of Paris, and defined the shape of the island. Standing above the sloped cement piling at the very tip of the island… it had been easy… to imagine that he was at the bow of a vast stone ship pointed downriver towards the distant sea, and that the Ile St-Louis on which he lived was a barge towed behind. Being narrower, the Seine in Paris has many bridges. Transport moves across its breadth by cart, on foot or on horseback in 1832. Only the smaller Ile Louvier is served by boats, its bank-side flanks silted up, making road transport easy. The ancient course of the Seine runs in a broad loop of marshland known as Le Marais, where in 1832 the market-gardens flourished. This ancient river-course is a lazy loop of a meander, similar to the curve on the western edge of Paris where the Bois du Boulogne fills a pendulous isthmus. In the past, the loop of the Marais silted up, as do most meanders over time, and the water flows through the straight cut. 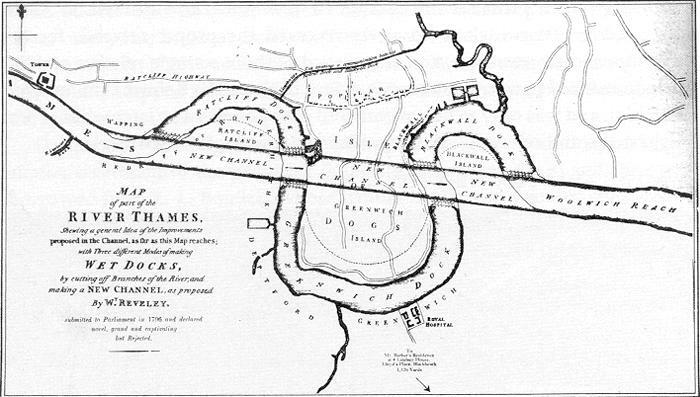 You can see how close London came to having a similar landform in this map by Thomas Reveley, which proposed a cut through the Isle of Dogs to create a fast channel. In London, the Thames is a broad river, with salt water in its blood. The tidal rise and fall helps remove detritus and refuse but also enables larger ships to sail upriver almost to the City. Massive dock complexes built in the Victorian period on the Isle of Dogs are matched by a crenellation of smaller wharves along the river’s upper reaches far inland. By the nature of its breadth, the Thames in London has fewer bridges. I’m no civil engineer, but I imagine that forging a tidal river with permanent bridge struts has different pressures and architecture than a river with a single direction of flow. There are no islands in London. Paris has the advantage of shorter spans, thereby enabling bridges with earlier technology to take hold of the river crossing. The Thames was wider, too, before the construction of the embankments which came later than those in Paris. The picture below (from 1677) shows a broad river with shallow banks, not the wharves and jetties of a wholly constructed city riverside. Paris, too, has a series of small wharves, visible on the map from De Bruyant, but there’s nothing to match the Isle of Dogs and the expansion – later in the 19th century – of the massive docks complex. The East India Dock and St Katherine’s Dock almost complete Reveley’s proposed cutting. Visibly, the differences are obvious. Standing in the shadow of Blackfriars Bridge, where I first envisaged the opening chapter of THE LAST RHINEMAIDEN, you can see the wide tidal Thames sweeping downriver past mudlarks and HMS Belfast, pouring the rain from the southern half of England into the North Sea. 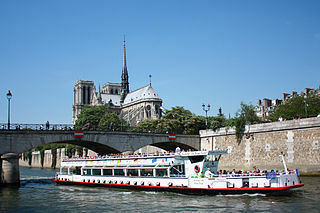 In Paris, seen from the Metro where it crosses the Seine between Quai de la Rapée and Gare d’Austerlitz, the river which drains the northern half of France rushes through domestic embankments, channeled, narrow, busy with tourist boats, under the eye of Notre Dame cathedral. Smaller streams feed each mighty river within the city boundaries. London’s Lost Rivers, a lovely book which I thoroughly recommend, shows where you can track down the underground streams across the city. Paul Talling explains where the little rivers give their names to streets and roads and parks. There is one little river within Paris mentioned in The Invention Of Paris: A History In Footsteps by Eric Hazan. The Bièvre (brilliant article with copious photos) is still visible on Google Earth, tracing its way through the landscape to discharge into the Seine, upstream of the islands. Different rivers, then, with their own particular character. In mythology, both of these rivers have goddess-names, associated spirits, which reflect their pan-Celtic background. Thamesis, goddess of the Thames (and the Isis, which is the name for the same river upstream of Oxford). Sequana, goddess of the Seine, named so by the Parisii who settled on its banks and fought the Romans at Alesia. Both names have been Latinised – the first taming of the wild Celtic spirit which so revered water-courses, rivers and trees, who Tacitus tells us worshipped a sacred king who ruled until sacrificed by one who would take his place. Next post in the SHADOWBOX series: Paris in 1832. P.S. Check out the SHADOWBOX page for a full list of posts in this series so far.